The availability of digital ultrasound at Aspen Ridge Equine Hospital gives us the opportunity to immediately assess an area of soft tissue swelling to determine the presence of tendon or ligament damage. This is essential to enable appropriate treatment modalities to minimize long term damage of the structure that comes from scar tissue development. An ultrasound probe emits sound waves that transmit through tissues differently based on changing tissue densities thus providing a real time image of the soft tissue being evaluated. Digital ultrasounds also allow assessment of boney margins, joint structures and even provide a view of deeper soft tissue structures needing to be biopsied or injected. 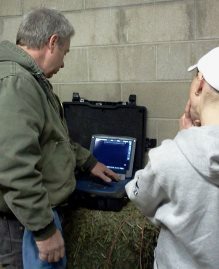 In addition to these uses, Aspen Ridge Equine Hospital routinely utilizes digital ultrasound to more accurately assess soft tissue growths that may by cysts or abscesses or solid masses, to evaluate inner structures of the eye to assess ocular disease or to accurately inject deeper joint structures in the diagnosis and treatment of lameness, among others. Like Digital Radiography, digital ultrasound images can be readily sent to owners or other veterinarians on the computer.